A stir fry is just the thing for a quick and easy dinner, and this dish uses straight to wok noodles to make it even simpler. If you like, swap the beef for chicken, pork or serve with salmon fillets. 1. In a bowl, mix the vinegar, sugar, oyster, fi sh and soy sauces. Trim and discard the excess fat from the steak, then fi nely slice the meat; add to the bowl with the marinade. Meanwhile, blanch the broccoli in a pan of boiling water for 2 minutes. Drain and rinse under cold water to cool, then set aside on kitchen paper to soak up the excess water. 2. Heat the oil in a large wok until smoking hot. Add the garlic and fry for 30 seconds, then lift the beef from the bowl, scraping off and reserving as much marinade as possible. Add the beef to the pan and stir-fry for 3-4 minutes until coated in a sticky glaze. 3. 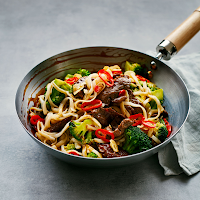 Break up the noodles inside the pack, then tip into the pan with the broccoli, chilli and reserved marinade. Toss together for a final minute until everything is cooked through. Serve immediately with lime wedges for squeezing over, if liked. For a little crunch, sprinkle some chopped, roasted peanuts over the top of the noodles.